Installation is our expertise at Emerald Coast Air. We offer the highest quality installs in the business. Installing a new air conditioner and heating system requires talented and also experienced technicians. We never recommend replacement equipment unless it’s needed. Upon diagnosing your air conditioning and heating system we will gladly provide a free estimate for the repair compared to the replacement cost. We take pride in offering different solutions that meet your needs. In addition to providing a free estimate we also offer a hassle free financing monthly payment plan. Choosing Emerald Coast Air for your heating cooling install means you get dependability, knowledge and also the experience to get the job done right the first time. Humidity problems: If you are starting to notice mildew or a musty smell your air conditioning and heating system could be losing capacity. Poor inadequate equipment and leaky ductwork can cause the air to be too dry or too humid during the winter and summer months. Your cooling system is the only means of removing excess humidity. Frequent Breakdowns: If your air conditioning and heating system seems to be steadily declining; and therefore the same problems keep arising it is probably time to install a new air conditioning and heating system. If your compressor or motor start to fail due to age or improper installation, replacing these components could cost several thousands of dollars. The better option could be to install a new air condition and heating system. Energy Bill Increase: If you have noticed an increase in your energy bill over the last year it could be time to install a new heating and cooling system. As major components start to fail or age they therefore require more energy to help make them work. Age of Equipment is 10+: If your air conditioning and heating system is 10 years or older it may be time to replace it. As your system starts to age it starts to lose its efficiency and it also may start to require frequent repairs. Frequent repairs become costly and do not guarantee an extension of life on your air conditioning and heating unit. When installing a new air conditioning and heating system you will have the new Energy Star tax deductible label as well as manufacturer warranties. Some rooms in your home are Too hot or Too cold: As you start to lose heating and cooling capacity you may notice a difference in temperature from one room to the other. Therefore this is a good indication that it may be time to install a new air conditioning and heating system. Emerald Coast Air is the best and highest rated heating and cooling installation contractors in Panama City Beach, Florida. We are committed to professional standards and ethical business practices. With our 100% satisfaction guarantee you can count on Emerald Coast Air for all your installation needs. We take pride in offering the highest quality system installs and use the highest quality Carrier equipment. 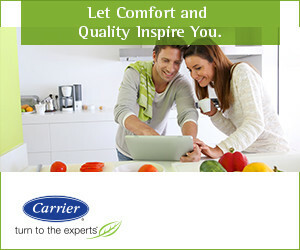 Our factory authorized and trained installers ensure your new Carrier® air conditioner and heating system will last for years to come. 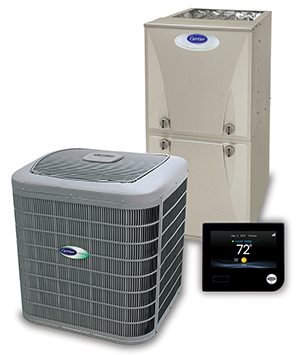 We will match you with the right system for your home or business based on your heating and cooling needs. We trust in the Carrier brand for our coastal climate and carry the Infinity that was made to withstand salt corrosion. For the highest quality heating and cooling installation with 100% financing and low monthly payments; contact us or begin the process by applying for financing today. Choose Emerald Coast AC – Your Local Installation Choice!